RPF Constable Recruitment 2018-19 Official Notification (RPF Constable Online Application Form) | Railway Protection Force & Railway Protection Security Force has already released the latest notification along with the RPF Constable Ancillary Application Form 2019 for the candidates. To apply for the event the candidate is required to know all about RPF Constable Recruitment CEN 03/2018. We are here providing you with all the necessary details about the RPF Recruitment for Constable Ancillary 2018 -19 Post. Check all the details like Eligibility Criteria, RPF Application Fee and method to apply here. Any candidate who aspires to apply for the Governmental Recruitments must be knowing about the Eligibility Criteria. If you wish to apply for RPF Recruitment for Constable Ancillary you must be familiar with the required Eligibility criteria. The candidates must fulfill the RPF Constable Ancillary Eligibility Criteria if they wish to apply for the RPF Recruitment 2019. Check all the important details of the RPF Eligibility Criteria and RPF Age Limit 2019. Nationality: The candidate applying for the post must be of the Indian National. Also, the candidates who belong to one of the reserved categories, as in resident of India or have settled in India with an intention of settling in. Read the official notice for the complete information. Age Limit: The candidate of general Category may be between 18 – 25 years as on 01/01/2019. Reserved Category Candidates will get relaxation in upper age limit as mentioned in the official notification. Educational Qualification: The candidate must have completed SSLC / Matric Examination from a recognized Board. The candidates whose results are awaited cannot apply for the examination. RPF Constable Recruitment 2018: Railway Protection Force has released Online Application Form and notification for RPF Constable Recruitment in Level 3 of 7th CPC Pay Matrix. RPF Constable Notification has released on 19th May 2018 on employment newspaper. RPF Constable Application Form 2018 will start from 1st June 2018. The last date to apply for RPF Constable Online Form is 30th June 2018. Railway Protection Force has declared 8619 vacancies for Railway RPF Constable recruitment. This year, RPF Department is conducting the biggest recruitment session ever in the history of the National Transporter with RPF Constable and SI recruitment across India. Latest Update : The Railway Protection Force has extended the last date of the Application Form Submission of the RPF SI Form 2018. Earlier, the last date for the Application Form Submission was 7th July 2018 which has now been extended to 10th July 2018. Candidates can upload their photograph and signature by 10th July 2018 and submit their application form submission process. In this article, we will provide you complete details regarding the RPF Constable Posts 2018, where you can get the complete details such as the Eligibility criteria, Application Fees, Selection and Application Process. 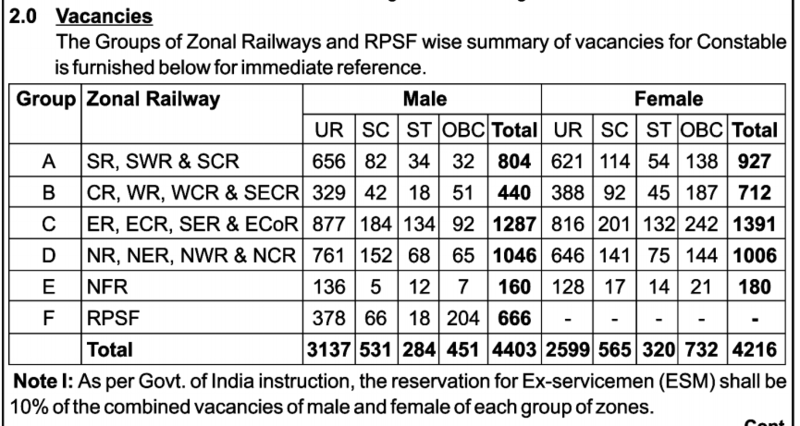 Railway Protection Force has declared 8619 vacancies for Railway RPF Constable recruitment. It is expected that 50% of the seats are reserved for the Female Category. The minimum age of the candidate must be 18 years and the maximum age of the candidate must be 25 years. The minimum age of the candidate must be 20 years and the maximum age of the candidate must be 25 years. Candidates must have completed 10th/Matriculation from a recognized Board/ University. Click on the RPF Online Link provided on the website. Fill in all the required details that are asked. Scan and upload all the required documents and certificates, photograph and signature that are asked. Download and take out the printout of the Application Form and keep it safe till the completion of the Recruitment procedure. After the final submission of the application form, if the candidate wish to make certain changes to correct the date other than the State, e-mail and mobile numbers, then they can change it by paying a small amount of fees of Rs 250/- as Modifications Fees. Click on the Modify Application Link. Pay the Modification Fees through any of the Payment modes. After making the payment, login again and proceed to make changes as per the instructions and submit the application. Take the Print out of the Application Form and keep it safe till the completion of the future. The Modification fees is applicable to all the category candidates. The modification to the registration and the application details can be done twice only. The Board will soon release the Application Fees details on the Official Notification. The Application Fees can be paid either offline or online. Candidates, if you have applied for Railway Protection Force Constable Posts, then you can now print your application form in seconds. The RPF provides candidates a secure facility to print their application form in few seconds. Keeping a print of the application form is very much required if you are applying for a certain Exam/ Job Recruitment. This can be useful in future reference. This year, the Railway Protection Force has invited over 1120 vacancies for aspiring candidates. Thus, candidates can now print in their RPF Constable Application Form. In this article, we will provide you complete details about RPF Constable Recruitment 2018 Print Application Procedure. Your Application Form will be displayed on the screen. There will be an option to print the Application Form. Click on the print option. Candidates who are interested to get recruited in Indian Railway Department, here’s a good news for them. 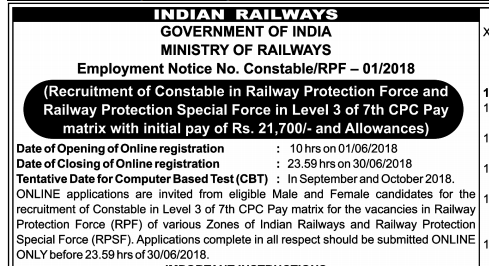 Railway Protection Force has released an RPF Constable Notification PDF 2018. Paper Cutting, Blood Relation Test, Seating Arrangement, Dot Situation, Character Puzzles, Rule Detection, Cause and Effect, Analytical Reasoning, Logical Sequence of Words, Grouping of Images, Verification of the Truth, Arithmetic Reasoning, Mirror Images, Image Analysis, Embedded Images, Pattern Completion, Water Images, Series, Data Sufficiency, Syllogism, Classification, Shape Construction, Series Completion, Paper Folding, Figure Matrix, Direction Sense Test. Sports, Indian Parliament, Basic Computer, Geography, Botany, National/ International Organizations/ Institutions, Everyday Science, Economics, Knowledge of Current Events, History, Culture, Traditions and Festivals, Inventions in the World, Famous Books and Authors, Scientific Research, General Awareness of Environment and Application to Society, Constitution, Chemistry, Basic GK, Polity, Famous Days and Dates, Art and Culture, Questions relating to the History, Physics and Zoology etc. Discount, Differential Geometry, Statistics, Ratio and Proportion, Time and Work, Fundamental Arithmetical Operations, Computation of Whole Numbers, Operations Research and Linear Programming, Time and Distance, Essential Mathematics, Differential Equations, Profit and Loss, Percentages, Real Analysis, Analytical Geometry, Mensuration, Use of Tables and Graphs, Interest, Decimals, Dynamics, Averages, Calculus, Number Systems, Fractions, Statistics, Algebra etc. Candidates can go through the RPF Constable Syllabus and Preparation for the Examination according to that. Please can anyone tell me i have made payment of RPF CEN 03/2018 POST through post office. but i forgot registration number and how to confirm payment. how to take print please can anyone give me suggestion. If you have forgotten your Registration Number kindly check your confirmation mail or SMS. The registration number will be mentioned on the confirmation mail. If you cant find it there too, kindly contact the help desk of RPF for your query. The link to recover your Registration Number is not active yet. Once it is active we will update you. RPF Admit Card 9th December 2018 ko release hoga. Abhi aap RPF Application status or Roll NUmber check krr skte ho. Agar aapka form select hua h to Roll Number bhi mill jayega. Application Status check krne k liye yahan check kijiye. Good morning sir, please tell me sir on which date rpf constable admit cards released. sir i fill my group d rpf form on 26th june. and when i try to print it then it shows “service not available” but when i logged in it shows your application is provisionally accepted. Sir tell me how i get its printout. sir, i was filling my RPF form and i registered myself in group C but i want to change my group C to group D .yet i have not completed the form ,just completed the registration process. please help me asap. Sir I started filling form and select the Group C in Zonal which is very far from me, so i want to change my zone and I have not completed my form yet.I just got my registration number from Group C and I want from Group D.
I have applied for RPF SI can I apply for RPF Constable through same registration no. CAN I APPLY FOR BOTH CONSTABLE AND SI EXAMS?? PLEASE DO REPLY. yes..you can apply for both RPF Si & constable exam. I have complete the form filling procee but i want to modify some field i have pay modification fee 250 but i am not able to modify the form still now what should i do. While modifying the application after paying the modifying fee some error came in the name of unexpected error. I changed my name by legally & New name updated in Aadhaar, Pancard also but, my certificates having past name only. For this have to submit supporting documents & anything else ? if you are interested then you have to fill the online form.